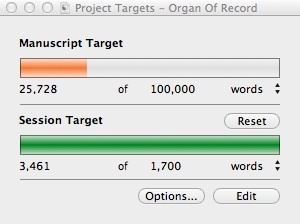 Jason Arnett dot com: NaNoWriMo: Halfway! makes a lot more sense than Writer Months, don't you think? 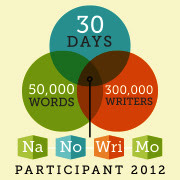 Last night I passed the halfway mark of NaNoWriMo only ten days into the month. Yikes. That means that I'm on track to write 75,000 words in 30 days. Right now I have some doubts as to whether or not I'll be able to make that target and that's okay. I've never written this fast before and I'm just kind of marveling that I'm able to put together the time in order to log one word after another into anything that's at all coherent. Well, not proof of coherency but proof of one word after another, I guess. Don't be confused by the 100,000 word target on the top line there. That's the target for the entire novel. I'm hoping to hit that target by the end of December. If I can continue on this pace (and as I noted I don't expect to but it's possible) I should finish the draft of this novel on or about December 5th. We'll see. Even that would be ahead of schedule from last year. Not worrying that this initial draft - the Zero Draft - isn't perfect. This is just a treatment, really. The real work will be in the editing. That's what'll happen after the first of the year, the cleaning up of the hot mess of a novel. That's JENGA. First: Know the beginning of your story - the inciting incident. Know the bits that establish the world of your story as normal and the things that cause the character to be drawn into the action of the story. If you have an image that starts the novel off, even better. This might constitute up to 25% of your story, no matter whether it's a short story or a novel. This is essential. Second: Know the ending of your story. Who lives, who dies, who is fundamentally changed by the events of the story. Maybe the last 20% of the tale. Better still, if you can visualize the final scene or image you'll know what to drop in when you're stuck in the middle. Look, I've gotta get back to writing. When I feel like I can come up for air again I'll talk a little about the process of discovery in the middle.